Our mission is to work for the rehabilitation and empowerment of the marginalised and destitute especially women and children in West Bengal. Ankur Kala provides training for its women in making of various handicrafts and food products, giving them a viable means to economic independence. In doing so it also develops the confidence life skills, and positive growth of the beneficiaries, our Ankur Kala graduates. A solid two-year training is given to a new woman trainee. Besides choosing a product group to train in, she starts from the alphabet – English and Bengali - if illiterate, and progresses to a simple course in Business Management, which includes costing, fixing selling prices, doing the budgets and also increasing the selling skills. Food Products: Sauces, Jams, Pickles, Squashes, Condiments. Handicrafts: Tailored items, various bags, hangings, decorative/household items,Tie-and-Dye and Batik. Catering: For parties, corporate functions, executive lunches. Paper and recycled paper products: Handmade Greeting cards, Paper bags. Ankur Kala helps market the Products, and trains the women in marketing. We regularly conduct exhibitions/sales of products, which are in good demand at fairs, schools and churches. Once the woman has completed training, she is given the option to start her own production unit or to work from home and earn income from the sale of her products. With time, our graduate woman is able to face a customer confidently, make invoices, do paperwork and sell her products with pride and dignity. Some women are also offered further management training as Supervisors, and these mostly remain to teach and guide new trainees. Under this programme, many women have grown into promising and strong leaders, who not only teach and train, but also regularly network with other women groups on different issues. 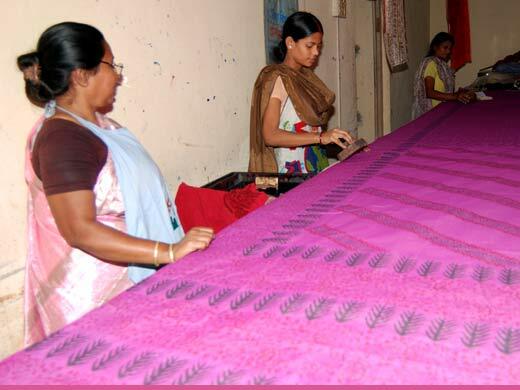 Block printing by our women on a beautiful pink sari.